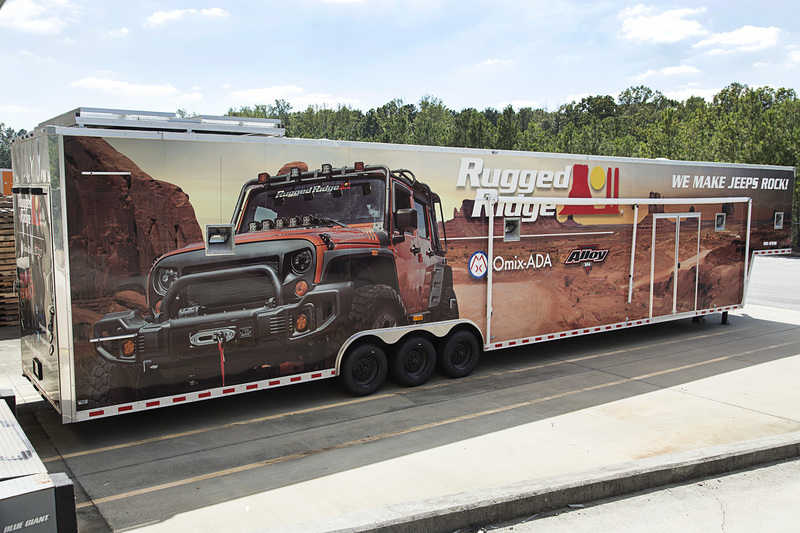 Suwanee, Ga. (September 22, 2015) – Leading manufacturer of high-quality Jeep® parts and accessories, Rugged Ridge, today announced that it is hitting the road with a custom designed trailer to raise the bar on their show efforts at Jeep and off-road events in 2016. Featuring Rugged Ridge’s iconic orange Jeep Wrangler (JK) Unlimited known as “Mango”, the 53 foot tri-axle gooseneck trailer showcases a vivid mountainous scene making the Jeep look truly larger than life, invoking the Jeep lifestyle. The company’s exclusive slogan of “We Make Jeeps Rock” is printed across the trailer, reaffirming Rugged Ride’s commitment to supplying the most innovative and cutting edge Jeep parts and accessories for the growing Jeep and off-road enthusiast market. For more information about the trailer, Rugged Ridge and its complete line of high-quality Jeep and off-road products, or to find an authorized retailer, please contact Rugged Ridge at (770) 614-6101 or visit its website at www.RuggedRidge.com. Omix-ADA®, Inc. is the world’s largest independent manufacturer and wholesaler of Jeep®, truck and off-road parts, accessories and floor liners. For two decades, Omix-ADA has designed, tested and manufactured more than 16,000 of the highest quality restoration and replacement parts and accessories. The Omix-ADA family of brands, Rugged Ridge® and Alloy USA®, are distributed throughout the USA and in more than 70 countries worldwide. For more information, please call Omix-ADA, headquartered in Suwanee, GA at 770-614-6101 or visit http://www.omix-ada.com.